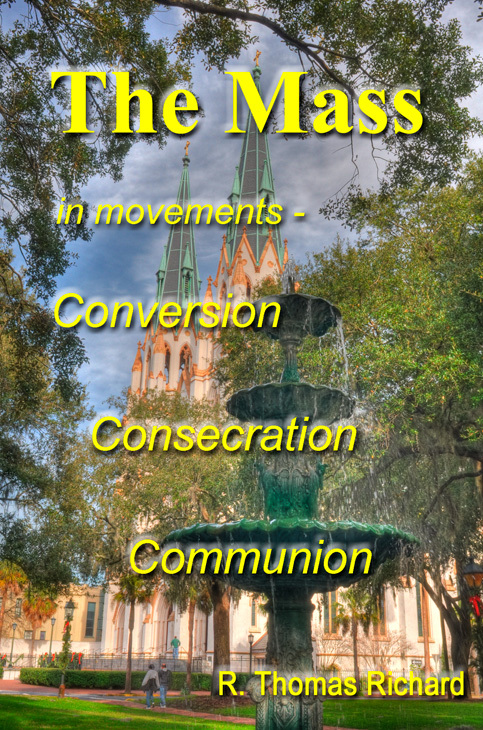 The background is the beautiful Cathedral in Savannah GA.
I’ve been pondering and reflecting on the Holy Mass for a while – led in doing so most recently by a commitment to give presentations on the Mass to groups of Returning Catholics in our parish. Our Returning Catholics program is a simple one – in six sessions – that we (the team) hope can be a helpful bridge to those who are considering coming home to the Church. We have presently in the six sessions, two on the Mass. The first of the two is on the “externals” of the Mass (the sacred vessels, the vestments and so on, with a “tour” of the church, the altar area and the sacristy). This presentation is led by one of our deacons, and consistently is greatly appreciated by the returning Catholics. The second of the two sessions on the Mass concerns the “internals” of the Mass: the spiritual meanings and intentions (and the interior participation from us that is being called for) that flow through the liturgy. This has been my “assignment” – to present this aspect of the Mass to the returning Catholics, to help them enter interiorly into the Mass more fully. After giving this presentation several times over the months, I found myself growing in understanding this most beautiful and supernatural work of God! I found myself growing in appreciation of the “movements” in the Mass, seeing in them a consistent “directing” in our souls to Christ, deeper and more complete as the Mass progresses. The Mass brings Christ to us! This book can help the reader bring himself to Christ in the Mass, and therefore find Him there, and receive Him. The Holy Mass is the liturgy at the very center of a Catholic Christian life. In the Mass we encounter Christ both in His Word, and in the Holy Eucharist – and in those two encounters, two liturgies, we find three distinct but related movements. In those three movements in the Mass we the Christian people are called first to Conversion, then to Consecration, and then to Communion. Each of the three is an encounter with Christ! All three are preparing us for the final Sending at the close of the Mass. We are a sent people: sent by Christ by His power, in His name, to finish the work that He began. The Church teaches that the Eucharist is “the Source and Summit” of the Christian life! (Catechism 1324) To personally receive this Source fruitfully – to truly attain the Summit which is present to us – requires of us that we are actually personally present to the reality of the Mass. This book takes the reader through the Mass, interiorly. In each of the major parts of the Mass, the reader is helped to understand and to enter the sacred liturgy with the “full, conscious and active participation” (Catechism 1141) that is necessary for the Mass to do its work in us. If anyone decides to try the book, please let me know what you think. I think that many Catholics don’t see the full invitation into Christ that the Mass offers! I think that many do not hear Him calling, waiting! Thus the book. I think there is a need. This seems like an excellent book and very appropriate since so many Catholic underestimate the value of the Mass. I’ll get Gaby to download the Kindle version. Congratulations! Thank you for your comment – and for getting the book yourself! Yes, it seems sadly true that many Catholics do miss what is going on in the Holy Mass. Or maybe to say it this way: no mortal man can appreciate fully the depths of the Mass! The Mass is as deep and expansive as the love of God. It is therefore so very important that every one of us Catholics earnestly seek and strive to enter into the Mystery, lest any of us miss what God so mercifully wants to give us, personally. Blessings and peace to you and Gaby. I finished reading your book about the Holy Mass and hope more people will read it. You cover so much spiritual food in this book (and it only takes a few hours to read) that it’s astonishing! As a cradle Catholic and taken religious classes daily from excellent nuns in my youth, my understanding of the Mass good. But, your presentation has only increased my love for the Holy Mass. Thank you for having taken the time and trouble to write this, it’s a gem. Thank you. I’m very happy to hear that you found it useful – helpful. The Mass is an immense supernatural mystery – and that we can enter into its depths even a tiny amount is a great privilege and gift. Blessings and grace to you and to Gaby! I join with Gene in thanking you for writing this little gem of a book. The Mass is so very important! It is the “Source and Summit” of our Christian lives, yet so few seem to give it the importance that it deserves. Your book helps the reader to ponder deeply the Mystery of God’s Love, and truly begin to understand more fully what it means to worship in Spirit and in Truth. I wrote a review for the nook and I hope to write a review for the kindle also. This is a book that needed to be written and now needs to be read and lived.